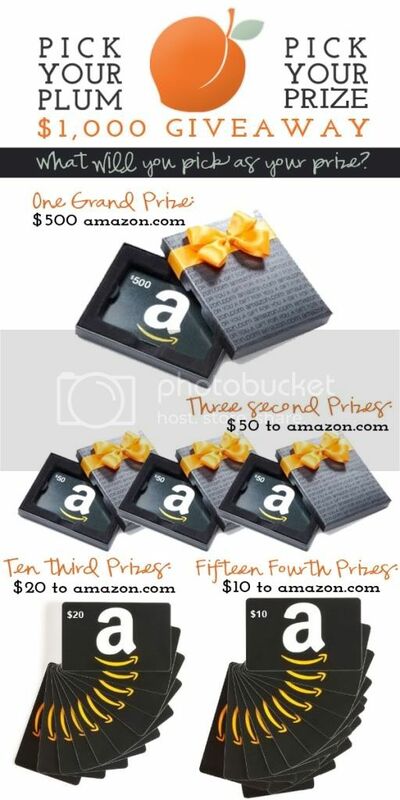 Kara's Party Ideas | Kids Birthday Party Themes: $1,000 Pick Your Plum Amazon Giveaway!!! Kara's Party Ideas | Kids Birthday Party Themes: $1,000 Pick Your Plum Amazon Giveaway!!! $1,000 Pick Your Plum Amazon Giveaway!!! Yes, you read it right! Are you ready for this?!! Pick Your Plum's - Pick Your Prize- $1,000 Giveaway!! Yes, that means if you win, you PICK your prize from amazon.com! This giveaway is worth $1,000!! To help spread the word about this amazing promotion, Pick Your Plum hand PICKED ten of their favorite websites for you to get to know. Let's be honest, most of you probably know about most of them because they are some fabulous places to visit. These are definitely websites that are worth getting cozy with. ENTER THE GIVEAWAY VIA THIS RAFFLECOPTER FORM/BOX BELOW! MAKE SURE TO LIKE ALL 10 SITES VIA THE LINKS PROVIDED FOR TEN EXTRA ENTRIES!!! If you don't already know about Pick Your Plum's favorite websites, take a peek, and fall in love. Here are direct links: Pick Your Plum, Skip to my Lou, Joy Folie, Make it and Love it, Discount Queens, Sugar Doodle, How Does She, Gracylu Originals, Oh So Posh Photography, Kara's Party Ideas, and College Fashion. *This promotion is in no way sponsored, endorsed or administered by, or associated with, Facebook. We hereby release Facebook of any liability. The sponsor, Pick Your Plum, will ship all prizes within 7 days of giveaway end. Giveaway starts Monday, Feb 13th at 8 pm EST and ends Monday, Feb 20th at 8 pm EST. Once the giveaway ends, Rafflecopter will randomly select winners. Winners will be contacted within 24 hours by email. The Rafflecopter widget will be updated with winners names. It wouldn't let me answer the question, so here it is... If they have ipads, I would like one of those, if not, I will take a Kindle Fire! Awesome giveaway and I'm excited to get to know more websites! I couldn't answer the last question so my answer is "Books, books and more books for my entire family!" Wow, thanks so much for hosting such a giveaway! thanks for the super chance! I am not sure what I would choose, butdefinately something all for me!! I couldn't answer the last ? but my answer is a pressure canner! Wow what w great prizes! What an awesome giveaway!!! Woo hoo!!!!!!! Thanks so so so much for the chance to win! I know what I'd want- a new camera! Love that you guys are teaming up to give away such an awesome prize and for so many! I'm sure to get some apothecary jars and many other cool party decorations if i win! Can't wait! I think Id get an ipad if I won! WOW such a great giveaway! I´m not really sure what I would pick.....a camera, cook books, clothes, shoes.....so many to choose from! Of course I would want the $500 Amazon card, which I could use to buy a new grain mill! I would definitely get an iPad. I've been wanting one for a very long time!! I would buy something for the house or Matryoshka stuff. A new flash for my camera! I would buy some ebooks, and lots and lots of PG Tips tea. What a great giveaway! I want a Toshiba Thrive Tablet. A bicycle for my daughter's birthday. If I won, I'd pick some faucets for my bathroom remodel. Fingers crossed! I'd get some books if I won! Our youngest son is away in another state, attending a university. I have some last minute things I still need for baby, so I would pick baby supplies like boppy and moby wrap. I'd get tons of throw pillows, bedding, and frames! Can I get a gift card? lol I read all the time and have a Kindle and could use the GC to buy books! I would buy a new Kitchenaid mixer or an ipad...it would be hard to choose! I would get a set of knives or a le crueset dutch oven. I've been eying all of the Rosanna cake pedestals on Amazon.com. It would be awesome if I won! I would get a good camera. Oh i want a kindle fire or a new camera or a vacuum! Really there are lots of fun things i want, thanks for the chance! id love a kindle fire! would be so great to win! I would honestly buy something for my new home and new hubby! I would get a new dining table and chairs I have been oogling for 6 months! I might just buy might friend the camera she has been oogling for 6 months! I would most definately pick a kitchen aid mixer as I absolutely love to cook and it would help heaps..
or even go nuts and get my munchkins something really fun to play with..
Would absolutely love to win! Thanks! This would be such an awesome prize! I can't wait to see who wins! Oh I'd totally get a coverstitch machine if I won the big prize! If I won the big prize I'd put it toward a new dining set! Otherwise I'd be shopping up the book section! If I won I would probably buy lots and lots if books and music, but there is so much to choose from on Amazon, I could change my mind at any moment. I would pick something to benefit the children in my classroom. Something we could all share and learn from. Awesome contest!! I would have a hard time choosing what i would buy with the gift card!! Most likely it would be anything for my kids!!! I would pick out something fun for my Lisa and husband. Such an amazing giveaway!! If i win i can finally buy the Cameo, yay! Cardstock! TONS of colored cardstock! I would love to get some new books and maybe a camera?? Thank you for directing us to some neat sites!!! Love this!! I would order all my American food that I can't get here in Poland. If I win it's going towards a Cameo or sewing machine. Very awesome giveaway. I would choose books and books and then some book shelves. would love to win all that is in my shopping cart! This is awesome!! I would love a Kinect!! We have a baby on the way, I think he needs some fun things for his room! Tried to leave a comment on the last one..no luck... I would LOVE to buy an iPad!! I'd buy something for my kitchen.....and I think that would be some deBuyer pans! Books and a kitchen mixer! I would buy cake decorating supplies. There is a new camera lens that I'm sure has my name written on it! What an AWESOME giveaway! I would absolutely go for camera upgrades - a lens, etc! What a fun giveaway...if I won, I'd buy an Amazon Fire. I would love to win the $500 gift card of course and put it towards buying new home office equipment. My printer is out and the rest of the room could use organizing for sure! I would buy a new camera with the gift card!!!! groceries, books and an iPad! I would by a Cricut!!! By the way, I discovered your site through this giveaway and I LOVE it. I would get an iPad for me and a kindle fire for my daughter! Thank you for this great giveaway. I would love to have the silhouette Cameo. If I won, I would buy items for my upcoming wedding: crafts for diy-ing decor, stationary, stamps, etc. Would help our budget immensely!! If I won, I would buy crafting supplies to jump start my business. I'd buy stuff for my girls' first birthday party! I think I'd stock up on some craft supplies I've had my eye on. Like a Cricut or Silhouette Cameo. I would buy some baby products for my new baby!! Thanks so much for hosting such an awesome giveaway! !